Jason Bruges Studio was commissioned by Cambridge Regional College to create an inspirational piece of permanent public artwork within the college’s student entrance. The artwork would serve as a communication tool for students to voice their opinions, messages and emotions. Blueberry designed and implemented the software required for the project, which included a touch-screen interface for students, a remote access administrative interface, and a control system for the large CCFL screen. The vision of Cambridge Regional College’s ‘Get A Word In’ project evolved out of a need for students to have a communication tool where they could voice their opinions, messages and emotions. However, complete freedom of speech was not considered an option and it was agreed that an element of censorship must be designed into the running of the artwork. The envisaged system was required to allow students to upload messages in 3 different ways; by inputting ‘words’; searching and selecting from a database of ‘phrases’; or searching and selecting from a database of ‘icons’. 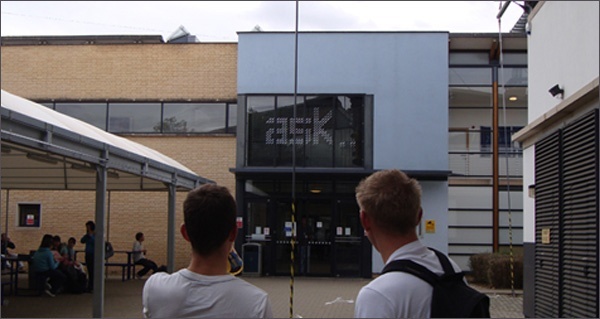 The project called for a large roof-suspended pixel screen display on which messages uploaded by students via a touch-screen interface could be scrolled. To apply a measure of control over what is displayed, activation of the input screen would only be granted after authenticating the user by swiping a student card through a barcode reader. The system was also required to log the student’s activities and monitor what has been uploaded. Additionally, a remote administrator was required to have the ability to update the ‘words’, ‘phrases’ and ‘icons’ that the students had selected, and to view a record sheet of what has been uploaded and by whom. Blueberry was asked to design all the software required for the project, including the touch-screen interface, an admin interface accessible via webserver, and a control system for the pixel display screen. Blueberry designed and implemented the software using .NET 3.5, SQL Server Compact Edition, and IIS 6. The brief included room for prototyping and any small modifications along the way. The initial database of words, phrases and icons were selected from Nuance’s XT9 library (the ‘words’); an Oxford University Press XML file of ‘The Oxford Dictionary of Quotations’ input into the SQL Server database (the ‘phrases’); and a .csv file for the ‘icons’. On the back of the JBS designs, Blueberry implemented two touch screen keyboards – one QWERTY and one phone-like. Both ran a form of predictive text input. The latter specifically made use of Nuance’s XT9 library for the predictive text using its statistical library to determine the most likely intended text – even correcting for mistyping. Designed and implemented by Blueberry as a website, the administrator interface is operated by staff at the college and can be used to apply a measure of control over what is displayed. Configuring communication between a mini PC, the touch screen interface and CCFL display screen, run by bespoke software created by Blueberry. Providing a complete hardware spec for the artwork project. Advice on the most appropriate pixel screen to use. The DMX protocol was chosen to communicate with the software correctly. Configuring the barcode reader to authenticate the user and activate the touch screen. Uploaded messages scroll across the screen from right to left on the CCFL pixel screen display within the college’s student entrance. 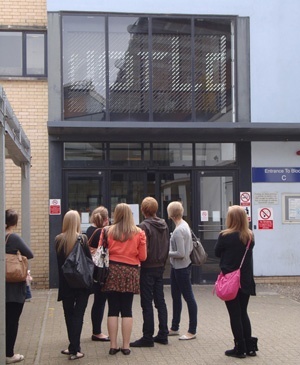 The artwork went live in October 2009 as a permanent public artwork within the college’s student entrance. Miriam Sleeman, project manager for Jason Bruges Studio, said: “Jason Bruges Studio have thoroughly enjoyed working with Blueberry Consultants on the ‘get a word in’ artwork. “Throughout the course of the commission Blueberry Consultants were highly adaptive to the needs of the project; working closely with Jason Bruges Studio and other relevant third parties to ensure the correct look and feel to the running of the artwork.